Last Friday’s historic Kim–Moon summit happened as quickly as it vanished from the headlines. ASPI provides a short video explainer , while The Diplomat  calms high expectations and explains why we’re still a long way from peace and denuclearisation. Duyeon Kim , visiting senior research fellow at the Korean Peninsula Future Forum, details what the purpose of the Panmunjom Declaration was and why agreement on definitions will be important during the upcoming Trump–Kim summit. And 38 North debunks  claims that the collapse of its testing site means that Pyongyang won’t be able to conduct nuclear tests. It appears we might be going two steps forward and one step back in terms of tackling the threat posed by Islamic State. Not only did the group claim responsibility for the deadliest single attack on journalists  and the media seen in Afghanistan since 2002 this week, but a coordinated Europol ‘propaganda takedown’  at the end of April appears to have barely dented  the group’s output across a number of platforms. BBC Monitoring has an insightful analysis  of IS content during and immediately after the takedown. Over in the Middle East, Tunisia is holding municipal elections—a first since the uprisings of 2011—and Lebanon is holding its first general election in nine years, both on 6 May. Aaron Zelin analyses  how Islamic State has consistently targeted Islamists around the region, and why Tunisia is likely to be vulnerable to attacks soon. Brookings offers a concise assessment  of what’s at stake in Lebanon, presenting an unusually positive outlook. To add to that, a record number of 86 female candidates are running in the Lebanese elections, compared to 12 in 2009! France 24 discusses  the effect of this unprecedented upsurge and the extraordinary mobilisation of women in politics. From women in politics to issues of ‘gender blindness ’ in national security: Just Security has published two excellent articles on integrating gender perspectives in counterterrorism (CT) processes. The first explores  how international institutions are becoming more attuned to the requirement to mainstream gender dimensions in CT. The second identifies  the challenges to achieving gender equality in CT without reinforcing gender stereotypes and compromising women’s security in the process. 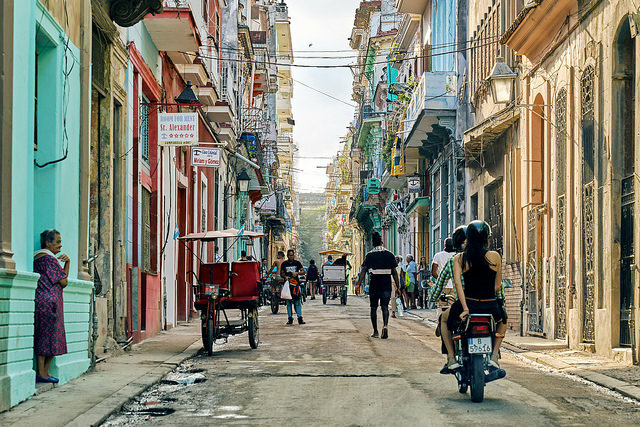 During the 1980s, Eusebio Leal, a bold historian, persuaded Fidel Castro that Old Havana was worth preserving, and that the restoration work could be funded by opening the tourist industry to foreign investment. Smithsonian.com has a fascinating piece  about how Old Havana went from the brink of ruin to being ‘the most ravishing and vibrant architectural enclave in the Western Hemisphere’. And in a tale of failed modernity, Places Journal  takes us on a journey across Karachi’s abandoned railway line; a far cry from the vision of innovation that it once promised. Ronald O’Rourke’s Congressional Research Service report on Chinese Navy modernisation is now available here at Andrew Erickson’s  website . Also read Harry Kazianis on China’s deployment  of the DF‑26 intermediate-range ballistic missile (IRBM), and Peter Layton’s analysis  in Griffith Asia Insights on the implications of these new missiles for Australian security, including what it means for our ballistic missile defence choices. NASA has conducted a successful demonstration of spacecraft nuclear-power technologies in the ‘Kilopower’  project. This is a lightweight nuclear reactor able to generate 10 kilowatts of power for a lunar base. Also, China is looking to follow in SpaceX’s footsteps and develop reusable rockets with its Long March 8  booster, which could fly by 2020. Europe is doing the same with its Callisto  reusable rocket. Sticking with space, Congress has proposed a bill creating a new ‘Space Command’  within the US Air Force that could be an interim step  towards a US ‘Space Corps’, or even an entirely separate ‘US Space Force’. These ideas have been debated since mid‑2017, and President Donald Trump is very supportive  of the Space Force idea. The USAF isn’t so supportive of either a Space Corps or a Space Force, but the debate highlights growing recognition  that space is a warfighting  domain in its own right. The recent F-22/F-35 Hybrid  proposal to Japan by Lockheed Martin caused a lot of excitement , and it remains an option for Japan’s air force. Robert Farley has some thoughts on where this might lead in The Diplomat . The New York Times , Daily Beast  and Washington Post  all pay tribute to the work of Agence France-Presse photographer Shah Marai, who was killed in the Kabul twin blast earlier this week. Adelaide, 8 May, 12.30–1.30 pm, ANU National Security College, ‘Navigating the emerging world order’. Register here . Brisbane, 9 May, 2–3.30 pm, The School of Political Science and International Studies at UQ, ‘Documentary screening and panel discussion of Jihad Selfie’. Flyer here . Canberra, 10 May, 5–6 pm, ANU College of Law, ‘Australia’s role within the international refugee protection system: lessons, challenges and opportunities’. More info and registration here . Sofia Patel is an analyst, Jacqueline Westermann is a researcher, and Malcolm Davis is a senior analyst at ASPI. Image courtesy Flickr user Pedro Szekely.